Some football fans will be unaware that Swindon Town have a more successful history than a number of other clubs in the football league. Back when I first got into football they were a Premier League team, albeit for just the one season (1993/94). And although they recorded a few commendable results along the way, their defence too often capitulated and they conceded a record 100 goals. Going a lot further back, The Robins won the League Cup in the 1968/69 season, beating my team (Arsenal) 3-1 in the final. The high-point for the club this century came in the 2011/12 season, when they benefited from the peak of Paulo Di Canio's managerial career and secured silverware via the League Two title in 2011/12. During the same campaign they also reached the final of The Football League Trophy, but were defeated at Wembley by Chesterfield. 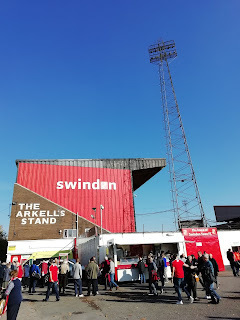 Nowadays Swindon are once again in the 4th tier of English football, and we were off to watch them in a mid-table clash with Mansfield Town. The game would also have a fair bit of added tension behind it, as the man now in charge of The Stags, David Flitcroft, was Swindon manager until the end of February when he swapped clubs. At the time of his departure from The County Ground, Flitcroft had guided Swindon to 7th place and a good chance of securing a play-off spot. However, Mansfield were 5th in the table and were even better placed for promotion to League One, although as it transpired neither team maintained their momentum, with Swindon finishing 9th and Mansfield ended up 8th. On the day of our visit (October 20th), we got ourselves nice and organised, managing to get up to Manchester Road with a couple of hours to go until the 3 o'clock kick-off. As is customary we ventured into the 1st watering hole that we found, The Tap & Barrel, and settled down to catch the 2nd half of the Chelsea vs Manchester Utd game. This pub was definitely one for the home fans only, something that the doormen checked, and on our way in we were greeted by a DJ with a small rig in the corner, who was happily blasting out Ska and The Jam when the football wasn't on the TV. Complementing the retro feel was the cash-only policy, plus the opportunity to tuck into a cheese and onion roll (I duly obliged!). Before Swindon vs Mansfield got underway, we managed to cram in another pint in The County Ground Hotel. It's a pub owned by the local Arkells brewery, and sits on the road directly outside of the stadium, on the corner of the Arkells stand. It's therefore no surprise that it's an establishment that is loud and proud in it's support, with the Swindon Town badge painted onto the walls above the bar. And just like at The Tap & Barrel there was a definite, and welcome, theme with the music, as Madness and other classics from that era blasted out of the speakers. The County Ground is a fairly traditional looking football venue, although it's obviously had several changes since opening in 1896. The 2 side stands are tall and covered, which is in stark contrast to the low level stands that sit behind both goals. 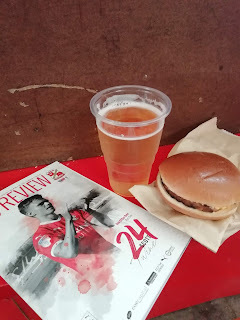 Before entering my mates made the wise decision of stopping by the portable burger stand outside The Better Town End Stand. And judging by what they got for their money, they were a lot more satisfied than I ended up being with my burger at half-time! Whilst it wasn't terrible, you could certainly see the difference between a freshly made one outside, and one that had sat around inside. As for the game itself, it was one of scant opportunities, resulting in the first 0-0 that 90 Minutes Online have witnessed on their #FootballAwayDays. First half highlights included a well worked free-kick for the away side, which saw a decent diving header saved from Danny Rose. Whilst Swindon nearly made the breakthrough when Keshi Anderson had his shot smothered by an onrushing Lawrence Vigouroux, following a clever through ball. However, the biggest drama came just before the break, when Mansfield midfielder, Will Atkinson, was sent off in the 43rd minute after receiving a 2nd yellow card. His first one had been a clear booking, after scything down former Premier League stalwart Matt Taylor. But the second seemed a bit soft, after a slight nudge on Anderson sent him flying, that being said it was a foolish decision by Atkinson. Meanwhile, a section of the home fans caused amusement with some colourful chants directed at their former manager in the opposition dugout. Following my disappointing burger, the 2nd half saw the home side naturally trying to press home their numerical advantage. Mansfield were still threatening though, as Danny Rose appealed for a penalty (it never was!) before Tyler Walker flashed a shot just wide from the ensuing scramble. The problem for Swindon was that they only went for broke in the last 15 minutes. Elijah Adebayo spooned a close range volley wide, Matt Taylor hit the post with a low free-kick, and finally Anderson had another shot saved. And that was that. Since then Swindon have sacked their manager, former Hull boss Phil Brown, and replaced him with Richie Wellens, who takes charge of his first game today, versus Carlisle. As for Mansfield, they continue to have only lost once in League Two so far this season, and they remain on the fringes of the play-offs. They simply need to start converting more of their draws into wins, to stand a realistic chance of promotion. Following the game, we returned to The County Ground Hotel, before one last tipple in The Merlin. On the way there we got to see a Swindon landmark, the 'Magic Roundabout', although it's less magical and more just bewilderingly insane! On the way home, one of our party purchased a prawn sandwich. However, this wasn't one of those posh ones that Roy Keane once famously bemoaned, instead it turned out that it had gone a bit past its best, meaning it was swiftly discarded. This folly felt strangely apt for the experience that we'd had, the football hadn't been great, but the day was a lot of fun and it harked back to those simpler times, long before the Premier League era.